On Twitter, someone tweeted an article from last year on semantic search. While scrolling through the article, the Co-occurrence and Synonyms and Variations sections seemed to have a secret encoded message in them. Take a look. On the one hand identify another set of terms that are directly related to the topic of our content. And secondly to build a richer context for search engines. Were you able to see the secret message? Well it’s not really a secret message, it’s just a new way to look at Google and SEO. Think about this. If we are trying to discover companion words that we think Google associates with our keywords and then include them in our text, we are reinforcing what Google has already trained itself to do. We are not helping to “train” Google correctly. We should not be shaping our content according to what Google can now understand. We should be shaping our content for humans so that Google can accurately learn about how humans speak, search and engage on the Internet. By people trying to manipulate rankings with cookie cutter co-occurrences, synonyms and variations and other items, we ultimately harm ourselves. For example, imagine you and your spouse have a child. What if while your child was growing up, you continued to speak baby talk to them because you were afraid if you used bigger words, they wouldn’t understand what you were saying. If this continued on without any other outside influences, you’d eventually have an adult who couldn’t speak adult language or even understand it. Obviously this is an extreme example but it serves its purpose. The appropriate course of action to take would be to teach the child more advanced words and sentences over time. It’s the same with Google. This is the only world they’ll ever know if everyone continues to cater to them. Instead, we should be creating content that is written in a way that humans normally communicate. This goes beyond content and we aren’t the only ones concerned about this. Great to see more & more orgs investing in SEO, but it also means we’re getting more of a Google-shaped web rather than a web-shaped Google. We want to train Google, but Google (like that child) is still in the learning phase. We have many SEOs doing the “right things”; doing things Google’s way but to no avail. They are still being outranked by Black Hat SEO tactics. In a recent webmaster hangout with John Mueller, an SEO named Gary Lee had the chance to voice his opinion and vent a bit. 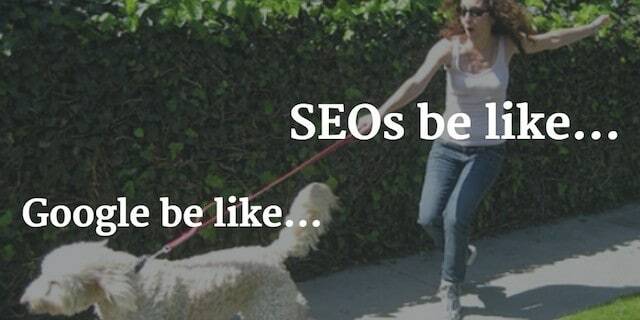 I don’t know about you but I’m sure many SEOs would agree with Gary Lee. If you’re interested, you can watch the full five minute vent to Google here. What do you think? Is it time for an SEO revolution?